Seeing is believing—so the aphorism goes. Conversely, it can be easy to dismiss that which we cannot see. 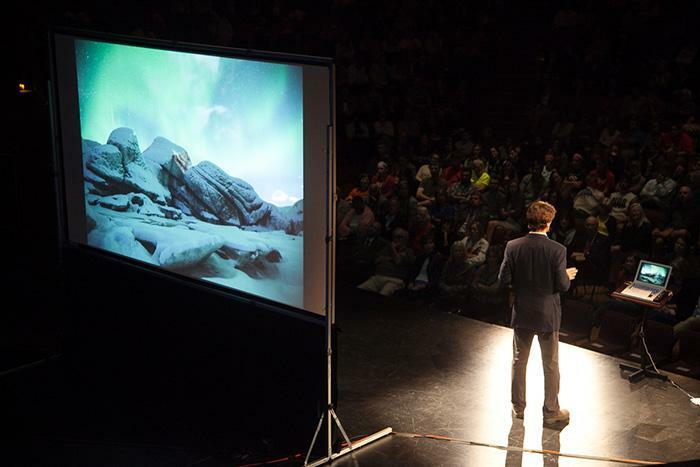 James Balog, the recipient of the 2014 Sam Rose ’58 and Julie Walters Prize at Dickinson College for Global Environmental Activism, is better acquainted with the concept than most. In 2007, the photojournalist/activist set out to bring the issue of climate change into sharp focus by using cameras and high-tech equipment to record glaciers in several arctic regions over the span of several years. Dickinsonians gathered to view a free screening of the award-winning documentary on Balog's efforts, Chasing Ice, as part of Homecoming & Family Weekend festivities. Two days later, Balog came to campus to discuss the film and his ongoing work. "Nature is not natural anymore; we are beyond the realm of natural variation," Balog said during a presentation that mixed science, photography, music and poetry to give the audience a visceral understanding of the impact of climate change. "We are in an uncontrolled science experiment, and we don't know how it turns out." Balog’s two-day residency included classroom visits and small-group discussions, an award presentation and a free, public discussion in the Anita Tuvin Schlechter Auditorium, which was live-streamed so that alumni and parents could join the conversation and ask questions via Twitter. In addition to the weekend screening, many students also had the opportunity to view truncated versions of Chasing Ice in class. The residency launched the college's new One College One Community initiative, which brings together alumni, parents, faculty and students to consider a common theme and connect through associated events on campus and around the world. Regional events featuring faculty discussing the issues Balog raised are scheduled in New York, D.C., Philadelphia and Baltimore so that the conversation can continue among members of the wider Dickinson community. Beyond warning about the negative effects of climate change, Balog also asked the audience members to add their own voices to the dialogue surrounding this issue and reminded them that the combination of science, art and storytelling can have powerful results.